Retiring Law Society chief executive Des Hudson saw his pay soar nearly 20% last year, it has emerged – but the society did turn a significant deficit into a surplus during that time. 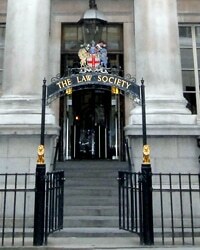 The society’s 2013 accounts – which were for the first 10 months of the year only due to a change in accounting date – reveal that Mr Hudson was paid £355,000 in salary and benefits during that period, and the Law Society told Legal Futures that in all he received £404,500 in 2013. This represented a 19% increase on 2012, when he was paid £340,000. This in turn was a fall on the previous year. The 2007 accounts, Mr Hudson’s first full year as chief executive, had him on a package worth £230,726. He steps down at the end of next month. Antony Townsend, the now departed chief executive of the Solicitors Regulation Authority (SRA), saw his pay rise a much more modest 5.6%. He was paid £198,000 in the first 10 months of 2013, equivalent to £237,600 for the whole year when multiplied up, compared to £225,000 in 2012. He also received pension contributions of £22,000 in 2013, comparable to the previous year. The accounts also show that while the SRA reduced its headcount in 2013 from 543 to 519, the representative arm of the Law Society increased staff numbers by 20% – from 230 to 274. Overall, the society recorded a net surplus of £7.2m for the first 10 months of 2013 on a turnover of £106m, compared to a £22.7m deficit on £120m income for the whole of 2012. The result included an exceptional gain of £8.7m from the finalisation of the defined benefit pension scheme, while an increase in practising certificate fees brought in an extra £7.3m or 6.1%, predominantly due to an increase in the cost of practising certificates. There was also a like-for-like increase in commercial income of £2.4m (12%). Chancery PII, the joint venture professional indemnity insurance brokerage service for small law firms launched in late August last year, wrote 128 policies to the value of £2.2m, the accounts reveal. Chancery PII earns a management fee based on a percentage of the premium written but does not take on any underwriting risk. The Law Society invested £16,667 in October 2013 in return for 33% of the share capital of Six Clerks Insurance Services Limited, the company running Chancery PII. In March 2014, the society exercised its option to increase the investment to 49.99%. The society’s other main external investment is in online compliance support company Riliance, of which it has 30%. Its investment in October 2012 comprised of £3,000 shares and £197,000 loan notes.